The queen of complementary medicine has taken it upon herself to share her rather calamitous crystal healing experience which occurred in the early hours of this morning. I’ve never been big on crystals and could never really see the point, and my mouth has tended to curl into a mocking sneer whenever people talk about crystal healing. Images of crepe sandaled ‘crusties’ with nose studs and vacant expressions spring to mind and I’ve frankly found it quite irritating when people waffle on about the zingy, throbbing energy that they feel from such and such a crystal whereas I always get diddly squat, short changed on the tingles as per usual. Still, I don’t like to be so prejudiced and admit defeat and so I decided that I’d go and buy a crystal and see if it might help me with my so far unsuccessful attempts to meditate. I’d read a fair bit about how crystals could amplify the meditation experience and so it was definitely worth a shot. All the books tell you to buy the crystal that you’re drawn to. I am a woman of exquisite taste and what was the crystal which was calling to me? Moldavite. Now the crystal cognoscenti will know that moldavite is the most expensive crystal on the planet, or in this case, off the planet, because it’s actually a fragment from a meteor which crashed into the River Moldau in the Czech Republic several million years ago. Not for me the humble quartz or fluorite, the pilchards of the crystal world. Oh no. I automatically home in on the Beluga caviar of crystals. After much deliberation, I purchased a truffle-like shaving of said meteor and carefully carried it home, terrified that I’d trip over and reduce it to a finger full of dust. The girl in the shop had warned me that it was extremely powerful. Yeah, yeah, I thought, and smiled patronisingly at her. I went to a bit of effort to prepare for my meditation. Well okay, I lit a candle, but it’s a start. I fired up the CD player with my Himalayan chimes CD which I really like because it conjures up images of benign Tibetan monks banging gongs and stuff. I lay on my back and placed a cushion under my head and decided to really pull out all the stops and placed the weeny fragment of muddy green moldavite on my third eye between my eyebrows. I decided that since I’m a natural born giver and am always being encouraged to receive, that on this occasion I’d actually ask for a few things for myself, and had drawn up a bit of a spiritual shopping list. First on the list was some healing for my messed up insides and then I asked for a bit of help with my book – a few chapter headings would be nice – and also a bit of direction with my animal healing programme. I directed these requests at my spirit guide(s). Now I’ve not really made my mind up about the spirit guide ‘thang’, despite being told that we all have them and that they’re there to serve us and do it joyfully, but that we have to be specific in our requests. Nevertheless I decided to play the game and try and reel them in for a recce with Reet. Did I feel anything? Did I cocoa. I went to bed shortly after this frustrating little attempt and fell asleep clutching my scratchy piece of crystal. I slept fitfully, but that’s nothing new, and I suspect it was as much because I knew that I needed to be up at 6.30am which is not a natural thing to be doing on a Sunday morning. It was 6.15am and I was flat on my stomach, tentatively sticking my toe over the side of the bed when suddenly, Wham! Doof!, I was flattened against the mattress by what felt like a 65 tog duvet pressing down on my back. This abnormal sensation was accompanied by a loud whooshing sound in my ears which I now recognise as that familiar sound which I experience when the beaded curtain between the material and the spirit world is abruptly drawn back. I was absolutely terrified. What on earth had happened? Had the spirit guide equivalent of Shrek popped in to give me a bit of healing? Or had an over zealous and hugely obese ET attempted to spoon me? My husband, as ever, was totally oblivious to what was going on and when I whimpered pathetically that something had jumped on me and that it must have been linked to the crystal, he said that it served me right for being so daft and why did I buy it in the first place? So no sympathy there then, as per usual. I had an hour and a half to mull this over as I drove to Oxfordshire and decided that I definitely needed to put a positive spin on the experience, and that I am so lovely and gorgeous that nothing bad could possibly have happened. One thing is for certain. I will never again pour scorn on the healing power of crystals and definitely won’t mess with moldavite. A lesson well and truly learnt. It’s an interesting one. About 13 years ago I was part of my local university’s insomnia group and the sleep psychologists would have erred on the side of sleep paralysis. Such a lot (on the paranormal front) has happened to me since then and my sensitivity has increased to such a degree that I’m now minded to think that what I experienced was my spirit body coming back into my physical body. I’ve had many out-of-body experiences in the intervening years. I think my re-entry into my body was rather clunky and probably woke me up because I’m a very light sleeper. Reminds me of watching baby pelicans learning to fly on the coast of Chile. They are such lovely comical birds but not the most graceful and the young birds would crash land on the surface of the water with an almighty thwack! That’s the best analogy I can think of. Of course, nobody can claim to understand this phenomenon. Long may the debate continue! Star Wars is ancient history people, and it happened right here in our solar system… the asteroid belt is what Darth blew to bits too..earths dumb scientists say there isn’t enough debris for the asteroid belt to have been a planet, what the dummies do not consider is that most of it has left and impacted on other planets…YES it was a freaking planet… they had beautiful green stuff there too..where do you think Moldavite came from.. Thank you so much for your most interesting and detailed comment – please accept my profuse apologies for taking so long to reply. I’ve been dealing with a bereavement and have had to put my blog on the back burner in the interim. My pre New Year’s resolution is to blog weekly…Well, the intention is there. Thank you for the offer of marriage but I’m already spoken for! I was talking to a friend today who is deliciously eccentric and sensitive and noticed a jagged green lump on her middle finger – moldavite, of course. There’s something very special about it. 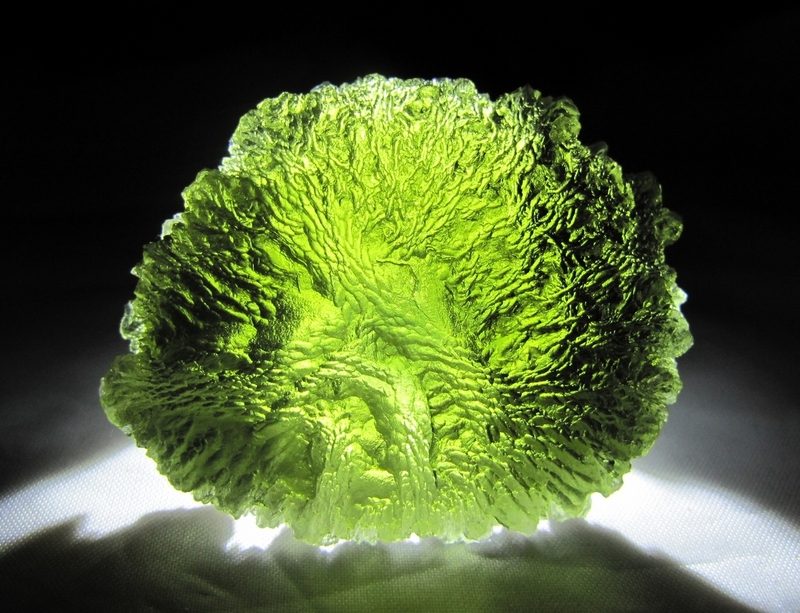 My unusual moldavite experience happened a while ago, back in 2005. I’ve learnt quite a lot since then and I’m now of the opinion that I was probably having an out-of-body experience. I’ve had many over the years and the sensation I felt was most likely my spirit body thudding back into my physical body. It’s a sensation that is now quite familiar to me. Like you I have experienced my fair share of paranormal activity – trapped spirits, objects moving around, strange noises in the early hours in my bedroom, and also, it would appear, some sort of contact with benign ETs who had a healing bent. It took me quite a few years to adjust to my heightened sensitivity but now I’m so used to it that it seems all rather normal, or at least it’s become my norm and is longer so alarming. Do you have people who can check out what’s going on? I do my best to understand what’s happening around me – invariably there’s a relatively straightforward explanation and some interesting learning to be gleaned, but I do call upon people with relevant skills to help me interpret what’s happening and, if need be, to move on any presences that are not benefiting me (or themselves) by being present. It might be helpful to have your home checked for geopathic stress which attracts entities and can seriously affect your immune system and damage your health. Spiritual hygiene and psychic protection are really essential when you’re sensitive. i imagine that you might also be interested in shungite if you’re a moldavite fan. Anything from Russia always intrigues me. I don’t work with crystals although I always have a crystal pendulum on me – I find dowsing a very practical tool. I’m yet to be convinced regarding the alleged healing properties of crystals, but would like to think that something might happen that will change my mind. I am a writer, researcher, healer and communicator. This blog contains some of my thoughts.